The shape of aerosol and cloud particles strongly influences the scattering of light. Therefore, on the one hand, it is important to know the shape of particles in order to estimate their radiative effect. On the other hand, the effect of different particle shapes on the properties of the scattered light can be exploited to get an estimate of the particle shape and the particle type. One way to estimate the shape of aerosol particles and to identify the particle type is the polarization-lidar technique. The concept of polarization lidar is quite easy. The lidar emits lineally polarized light into the atmosphere. The light is scattered at the components of the atmosphere. Their shape influences the properties of the backscattered light. Spherical particles don not change the state of polarization, whereas non-spherical particles cause a depolarization of the scattered light. The lidar receives in two separate channels the parallel (with respect to the emitted light) and the cross-polarized light. Dividing the backscatter coefficient of the cross-polarized light by the one of the parallel-polarized light yields the depolarization ratio. The polarization-dependent transmission and reflection of the optical elements has to be known. The detection of ice crystals is based on the measurement of the volume depolarization ratio. Backscattering (single scattering at exactly 180°) by spheres (liquid drops) does not produce any depolarization as shown in Fig. 1. Backscattering by nonspherical crystals introduces considerable depolarization (via the process of many internal reflections). 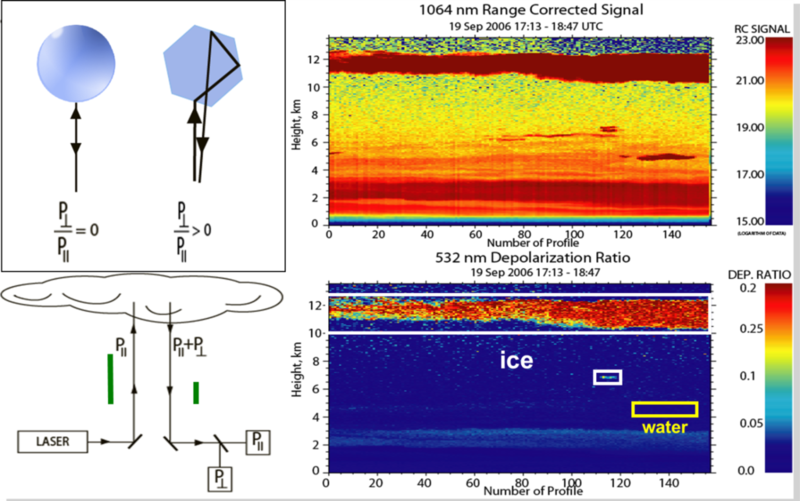 Thus, the volume depolarization ratio allows us to discriminate cloud layers consisting of water drops and cloud layers in which backscattering by ice crystals dominates. The separation of dust and marine aerosol is based on the same idea as the separation of ice crystals and liquid droplets. Figure 2 shows a measurement case from the SALTRACE campaign, performed in Barbados (13°N, 59°W) in the summer of 2013. Dust particles are irregularly shaped resulting in a high depolarization ratio (depicted orange in Fig. 2). On the other hand, marine aerosols under humid conditions are rather spherical and show a lower depolarization ratio (depicted blue in fig. 2). A dust layer (1.6 – 4.6 km above ground level) is on top of the marine layer. The layered structure is not visible in the backscatter (upper panel), but in the depolarization ratio (lower panel). Even the downward mixing of the dust particles into the marine layer is visible by an intermediate depolarization ratio (depicted in green).